Just Call Me Chaviva: Wait, you're NOT supposed to trash Chametz? Less than a year ago, I was gearing up for my first real (well, not really, I didn't kasher my kitchen at that time) observant Pesach. It was April 18, 2008 that I first went to an Orthodox shul for the first time, and wow here I am now a regular attendee of the local Orthodox shul, I stay weekly in the community, and I'm working on a conversion with the rabbi there. When I was getting ready for Passover last year, I went through my entire kitchen -- cupboards, fridge, freezer, you name it, I found chametz and items with chametz and kitniyot (not getting to a kitniyot blog this year, it just isn't worth the time or energy). The result of my search was a donation to a local foodbank of some unopened stuff, and a gigantic box of stuff that I put in the lobby of my building with a note for people to PLEASE TAKE since Passover was coming. The thing is, when I learned and read about Pesach, in my mind, the whole point was to not be in possession of chametz -- period. Not in the house. Not at the office. None of my spaces could have the dirty little leavened goods. This whole selling your chametz thing throws me for a loop. I remember doing it last year, on one of the last days, because I was told that's what you HAVE to do in case there are crumbs. But believe you me, there was not a single product with chametz in my house. Isn't that the point? Didn't the rabbis say that you couldn't have chametz, period? They didn't say to throw it in a cabinet, cover it with foil or tape it off, did they? The point is to go a week without it, to get rid of it, to purge. Purge!Now, it makes sense that college students, people living in poverty, the elderly, etc. would keep their chametz and just block it away -- throwing away a bunch of bread and chametzdik products could be completely hazardous to their finances, their health, their livelihood. But the rest of us? People who can afford to go to the grocery store and re-purchase that $1.00 box of pasta? That $1.50 loaf of bread? Really? We can't manage to donate that stuff to a food bank and purge the chametz? I don't know if this is really radical or ridiculous thought, but if I have my way, in the future, when I'm married and what have you, there will be no chametz in my house. It just makes sense to me. This whole selling thing seems like a crock. On that note: I still haven't gotten my kosher l'pesach Coke. I haven't seen it anywhere, and this severely bums me out. I'm leaving tomorrow night for New Jersey where Tuvia and I will be spending a day or so, and on Wednesday morning we're heading to West Palm Beach for Pesach with his dad's family. 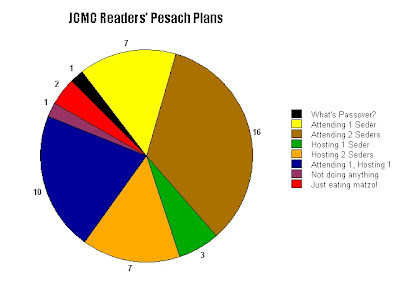 So for now, I'll leave you with the results of the most recent poll -- Pesach plans! For me, I'll be attending two seders. I think it'll be a long time before I'm hosting my own. Sorry about the hideous color scheme. Not sure how that happened!